The ultrasound last Friday showed that the placenta had moved up about 4.5cm away from the cervix (the doctor wanted it to be 2.5cm away), so that is good news and we can go forward with plans for a vaginal birth. We also took a preparing for birth class and now feel a little more prepared as far as when to go to the hospital and different positions for coping with labor. I am feeling the effects of the heat. Yesterday my ankles were so swollen it look like I sprained them and they are still swollen this morning. Other than that just plain 'ol hot feeling and not sleeping well. We are headed up to my grandparents house on the beach this weekend to cool off. MckMama is on a break from Not Me! Monday this week as Stellan is once again in the hospital battling SVT and planning on an emergent heart surgery in Boston soon. 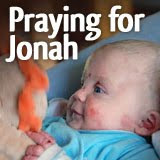 Please be in prayer for baby Stellan. As for me, here are my Not Me's! I am not wearing Devin's belt cause none of mine fit around me anymore. I am definitely not counting down the work days I have left before I take my leave (11 days!) and I am not counting down the days until Baby Jenson arrives either (37 days!) Not me! And I am not glad that I am working this week (well, Monday, Tuesday and Wednesday) cause I work in an air conditioned office and the temperature is supposed to be in the 90's all week (99 degrees on Wednesday!) No way. Who would be glad about working! And we have not found that our new favorite card game is bridge. Yes, we can only play it with my grandparents (who taught us how to play) cause they are the only ones we know who play. Anyone out there play bridge? That's it for another week of Not Me! Monday. 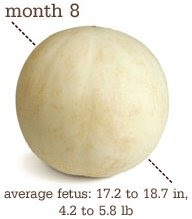 This week our baby is around 5lbs and could be as tall as 20inches. We are having an ultrasound on Friday, so will know more about how big the baby actually is then. Not much going on with baby this week. If our baby is a boy, his testicles are descending from his abdomen to his scrotum this week. Also our baby's fingernails are now reaching the end of his or her tiny fingers. I am trying to keep cool in this hot weather. I am not too bothered by it yet but am more tired and short of breath and have some feet swelling. The doctor's appointment this morning was uneventful. I have gained 27lbs and am measuring 35cm today. I am a little nervous about the ultrasound on Friday. On one hand, a c-section at this point doesn't sound half bad, but I know a vaginal birth would be better. Whatever is best for baby and I is what I want. We shall see which way it will go after Friday's ultrasound. MckMama and others are doing a variation of Not Me! 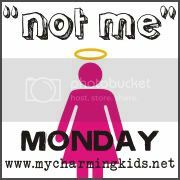 Monday and instead doing Not My Child! Monday. Since I don't have a child (yet), I decided to stick with the good ol' original. I am definitely not taking full advantage of every chance I get to sleep in. I am not sitting here writing this at 10:30am still in my PJ's. Not me! I am always up and about early to start the day. I did not get bored and miss my husband this weekend when he was gone for 3 days! (our first nights apart). I did not have dishes piled up for 3 days when my sister came over and she did not do all the dishes and clean the kitchen while I did nothing. Oh and I did not have a slice of chocolate cake for breakfast this am and try to justify it a little by having a glass of nutritious milk with it. That wraps up another Not Me! Monday post. Check out MckMama's blog for Not My Child! Monday. I am all inspired and motivated to start making some things especially since I have the next 10 days off work. These are the things I want to make: nursing cover, sling, diaper bag, booties, wet bag and foam blocks. I am going to the fabric store today to get supplies. We'll see how much I get done, and what turns out right. Yeah new picture this week! 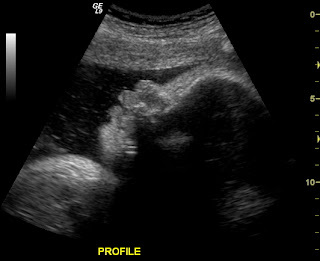 Our little one is now around 4.5lbs and will be gaining about 1/2 lb per week. As our little babe is getting so big, the room in my uterus is maxing out and the fluid levels are about maxed out which means less cushion from all the kicks and pokes. This week our baby's immune system is developing with my antibodies passing to our baby. I hardly ever get sick so I hope I can pass that onto our little babe. I am still feeling great. I am not really feeling uncomfortable except for the heartburn. I can still pretty much do everything I want and did before, though sometimes a little slower. I am getting anxious for the next ultrasound which will determine if I need to have a c-section or not. Oh and correction to last weeks update: I have not gained 28lbs, only 26lbs (and yes, 2lbs makes a big difference). I forgot that the doctors scale weighs 2lbs more than our home scale. I had my first baby shower last weekend and am now feeling a little more ready for our little babe to arrive. Thanks to everyone who was able to be there and for all the wonderful gifts! Another week gone by, time again to air our dirty laundry. I have not been watching the "Birthday" or "A Birth Story" shows on the Discovery Health channel and am getting kind of freaked out about giving birth. Is it too late to turn back now! 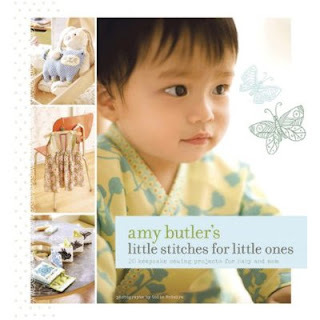 I am not totally excited about the new Amy Butler sewing book that my sister Sidney gave me for my baby shower. I am not already planning what I am going to make. And I am not excited that I am off work next week so I have lots of time to make things. I did not enjoy showing all the shower gifts to Devin and then putting them away in the baby's room. Not me! I am not that silly. I don't just go into the baby's room and look around. I am not sitting on the couch writing this blog entry while watching "South Park." That about wraps up another Monday. You can check out what MckMama and every one else has Not been doing this week here. 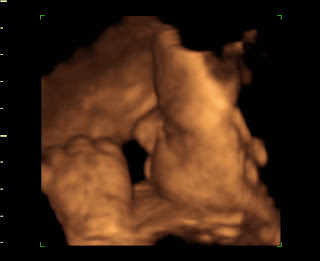 This week our baby is weighing in around 4lbs and around 19in in length. This week our baby is practicing for the real world, breathing, sucking, swallowing, and kicking. And our baby is finally no longer see through. His/her skin is now opaque just like yours and mine. I am still doing well. I have gained a whopping 28lbs thus far. Yikes. At the doctor's appt this morning I measured 34cm which is a little big for 32 weeks which freaks me out a bit. Remember this. Everything else is well with baby and me. Not much new this week. The evening is not complete without a bon fire! New Not Me! Monday logo. Pretty cute huh. I did not end up working 13 hrs on Friday! when I was on-call for work. And although I work that much, I am not totally excited that I don't have to be on-call again for a very long time! At least until my maternity leave is up (if I decide to go back to work). I am not sunburned on my scalp, legs, back, chest and shoulders from wearing a little tank top and shorts yesterday even though I tried to stay out of the sun. Not me. I always protect my skin with sunscreen. I didn't even try to just get a little color on my legs. I love my white a ghost legs! I do not forget sometimes that I have a huge belly and flop down on the bed or almost jump to put my body over a log while swimming. I would never forget a thing like and I always protect my baby. I am certainly not kind of pleased that the weather has cooled down and might even rain this week so that I can get some things done around the house and yard. I am not totally lazy when it is too hot. Not me! That's a wrap for this week. Check out MckMama's blog for what she and everyone else has not been up to this week. This week our little one is over 3lbs now and around 18inches long give or take a little. (I was 18inches at birth). Our baby will still gain about 3-5 more pounds, though I hope only about 3 more pounds and is just about at his/her birth length. This week our baby's brain connections are developing and our baby is already processing information, tracking light and perceiving signals from all 5 senses. Amazing! The books say our baby is sleeping more and developing more definitive sleep and awake (kicking) patterns, though I have yet to really notice this. I am still feeling great, though starting to feel huge. My mom measured my belly today and it was 39.5 inches around. Some people say I look big, others think I look small. Some say I am carrying low. Seems everyone has a comment and wants details about our baby, even strangers on the street! It's the weirdest thing. This is probably the weirdest thing about pregnancy I have noticed yet - the conversations random people/strangers start just 'cause I am pregnant. Only 2 months to go!! !